Do choose stores that are low, medium, and high-end. Also, register for many gifts in a wide range of prices, so guests have a variety to choose from. Don’t tell your wedding guests where you are registered. Once you have registered, give the information to immediate family, very close friends, and wedding party, and allow them to spread the word. If you are asked where you have registered, it is perfectly fine to tell, but it is not proper to include registry information in a wedding invitation. Registry information may be included on a wedding website, as long as the actual name of the store is not included on the same layer as the main wedding information. Organize your website so that guests must click down one level to locate registry details. Do complete your registry four to six months before the wedding. This will give guests time to purchase gifts for the big day and also for your shower. Don’t ask for money. However, while it’s inappropriate to ask for money directly, financial registries have made this less awkward by allowing couples to register for their honeymoon through a travel agency or an online service such as TheHoneymoon.com. Some banks have programs that allow couples to establish a special account to which guests may give money earmarked for a down payment on a home. Do display your gifts in a central location within your home, such as your dining room, to share with your intimate friends and visitors. Emily Post’s book states that wedding presents should be sent ahead of time so they can be unwrapped and displayed in the bride’s home “to show them off in a pleasing manner, not to brag but to show appreciation of people’s kindness”. Do review your registry every few weeks, and more frequently as the wedding approaches. Use your updated registry to help you keep up with your thank you notes. Ideally, you should acknowledge every present immediately; writing a note the day you receive it is best, but sending it within two weeks is also acceptable. Of course, the period surrounding your wedding is a busy time; if you fall behind, just make every effort to send a thank you as soon as you can, but no later than two months after the event. This stunningly gorgeous couple said “I do” at the Basilica of the National Shrine of the Little Flower. The wedding reception was held at historical Pear Stable, and Angela’s chosen vendors did not disappoint. DeVinnie’s Paradise provided top notch floral designs; Absolutely Delicious Catering did what they do best, and yes it was absolutely delicious. Bryan from Lumen Events rocked the party late night all the way to the Aggie War Hymn. It was a super night with long lasting love to remember. Congratulations Angela and Joseph! Volare Wedding & Event Planning thoroughly enjoyed working with such a sweet couple and gracious family. Are your guest list and budget incompatible? Try creating four lists and label them A, B, C, and D. Your A-list should include those who you cannot imagine being absent on your wedding day, such as immediate family members and close friends. Aunts, uncles, cousins and other friends you’ve stayed in touch with should make up your B-list, while your C-list should include coworkers and your parents’ friends. Finally, your D-list will include distant cousins, friends you have lost contact with and your parents’ colleagues. As your list grows and you need to eliminate people, start with your D-list and work your way backward. It is appropriate to invite an unmarried person without adding “and guest” to the invitation, however if it is known that this person is dating someone seriously, it is thoughtful to invite his or her significant other. It is not acceptable to invite one-half of a married couple, one-half of a couple living together or one-half of an engaged couple. Think carefully about sending wedding invitations to people you know cannot attend, as it appears to be a solicitation for wedding gifts. If there are people you would like to inform about the wedding, you may send them a wedding announcement after the wedding. If there are people you know will not or cannot attend, but who may feel slighted if they did not receive an invitation, then by all means send one. If you work in an office of fewer than 10 people and wish to invite coworkers, the proper thing to do is to invite everyone. If you work for a larger company, you may choose to invite only a few colleagues. Remember that if coworkers are married or have a serious significant other, you must include their partners on the invitation. Branch out from traditional floral arrangements to save hundreds of dollars in your floral budget. These beautiful branches coordinate well with smaller table arrangements, while creating a rustic, natural ambiance suitable for a luxe winter wedding. 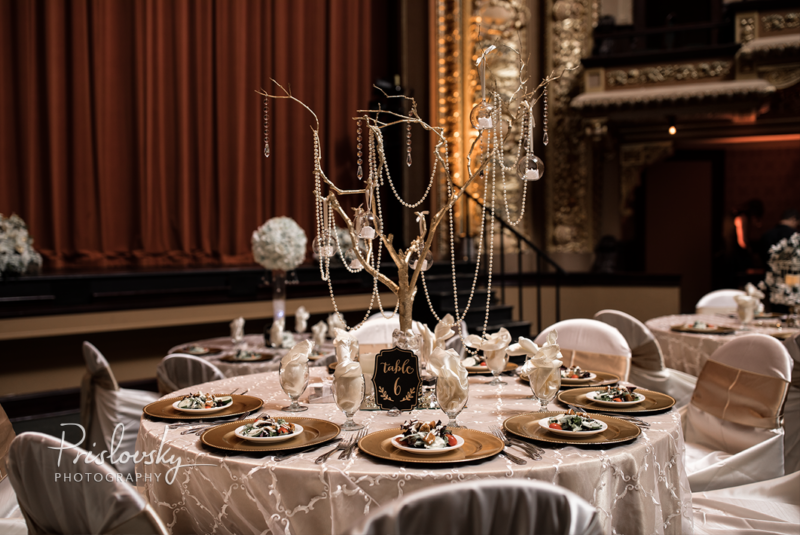 Tabletop and hanging votives and crystals will add elegance and warmth to your venue. Dani and Grant’s historic San Antonio wedding at St. Joseph’s Catholic Church was exquisite, and the party at La Orilla del Rio Ballroom at the International Center was just as memorable. Wedding guests came as far as Venezuela to wish the couple a lifetime of happiness. What a precious family and group of friends! Congratulations Dani & Grant! Thank you for allowing us to be a part of your day; it will always be dear to our hearts.